The quest to become a knight has occupied many over the years. In 1483, Sir Thomas Lemuel Hawke of Cornwall was among 323 killed at the Battle of Slaughter Bridge. Foreseeing this outcome, Sir Thomas wrote a letter to his children in Cornish outlining the Rules for a Knight — the life lessons Sir Thomas wished to pass along to his four children. The severely damaged letter was adapted and reconstructed by Ethan Hawke, after the family discovered it in the early 1970s in the basement of the family farm near Waynesville, Ohio after his great-grandmother passed away. My wife was reading a book about step-parenting, and this book was talking about the value of rules, so we started saying, well, what are the rules of our house? And you start with the really mundane, like eight-o’clock bedtime, all that kind of stuff. And then, invariably, you start asking yourself, well, what do we really believe in? 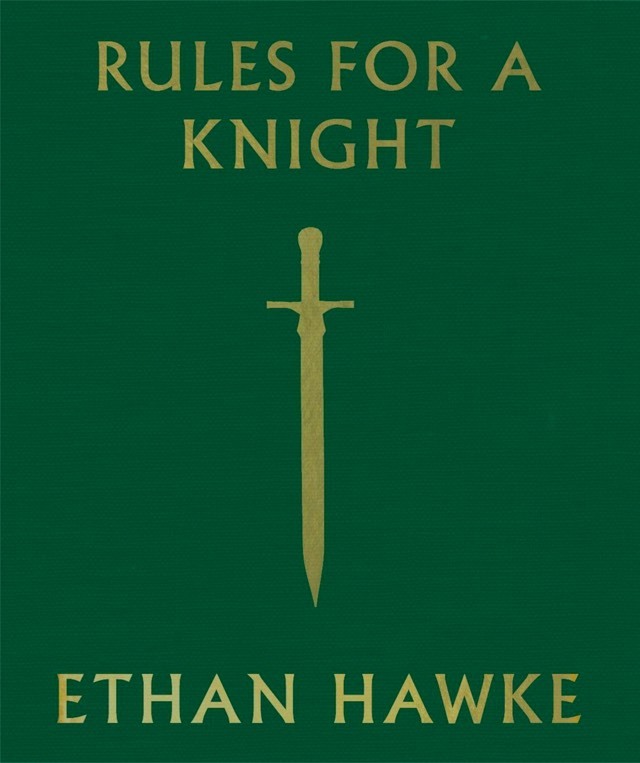 So I started riffing on this idea of ‘rules for a knight.’ Like, what does the king decree, you know? I wrote it out—the idea was we were going to put it on the wall, in calligraphy. Like, these are the rules. The work stands alone as a blueprint of civilized growth and self-improvement, the path to becoming a humble, strong, and reliable gentleman (or lady). The ideas mostly come from “other knights,” including Muhammad Ali, Emily Dickinson, Dwight D. Eisenhower, and Mother Teresa, as Hawke credits them on the acknowledgment page. Create time alone with yourself. When seeking the wisdom and clarity of your own mind, silence is a helpful tool. The voice of our spirit is gentle and cannot be heard when it has to compete with others. Just as it is impossible to see your reflection in troubled water, so too is it with the soul. In silence, we can sense eternity sleeping inside us. Never announce that you are a knight, simply behave as one. You are better than no one, and no one is better than you. Never pretend you are not a knight or attempt to diminish yourself because you deem it will make others more comfortable. We show others the most respect by offering the best of ourselves. Each one of us is walking our own road. We are born at specific times, in specific places, and our challenges are unique. As knights, understanding and respecting our distinctiveness is vital to our ability to harness our collective strength. The use of force may be necessary to protect in an emergency, but only justice, fairness, and cooperation can truly succeed in leading men. We must live and work together as brothers or perish together as fools. The quality of your life will, to a large extent, be decided by with whom you elect to spend your time. Those who cannot easily forgive will not collect many friends. Look for the best in others. Grace is the ability to accept change. Be open and supple; the brittle break. There is no such thing as a once-in-a-lifetime opportunity. A hurried mind is an addled mind; it cannot see clearly or hear precisely; it sees what it wants to see, or hears what it is afraid to hear, and misses much. A knight makes time his ally. There is a moment for action, and with a clear mind that moment is obvious. There is only one thing for which a knight has no patience: injustice. Every true knight fights for human dignity at all times. You were born owning nothing and with nothing you will pass out of this life. Be frugal and you can be generous. In the field of battle, as in all things, you will perform as you practice. With practice, you build the road to accomplish your goals. Excellence lives in attention to detail. Give your all, all the time. Don’t save anything for the walk home.The better a knight prepares, the less willing he will be to surrender. Ordinary effort, ordinary result. Take steps each day to better follow these rules. Luck is the residue of design. Be steadfast. The anvil outlasts the hammer. Do not speak ill of others. A knight does not spread news that he does not know to be certain, or condemn things that he does not understand. Sometimes to understand more, you need to know less. Every knight holds human equality as an unwavering truth. A knight is never present when men or women are being degraded or compromised in any way, because if a knight were present, those committing the hurtful acts or words would be made to stop. Love is the end goal. It is the music of our lives. There is no obstacle that enough love cannot move. Life is a long series of farewells; only the circumstances should surprise us. A knight concerns himself with gratitude for the life he has been given. He does not fear death, for the work one knight begins, others may finish. The rest of Rules For a Knight goes on to explore these ideas in greater detail. Despite its fiction status, the book is a timeless meditation on self-improvement and what it means to be a parent.